It is being manufactured in Romania by SC UZINA MECANICA SADU. It is chambered in 5'56x45mm, either manufactured with an AK magazine well or with a STANAG magazine well, and operates by short-stroke gas piston, half-way between an AKM and an Armalite AR-18. 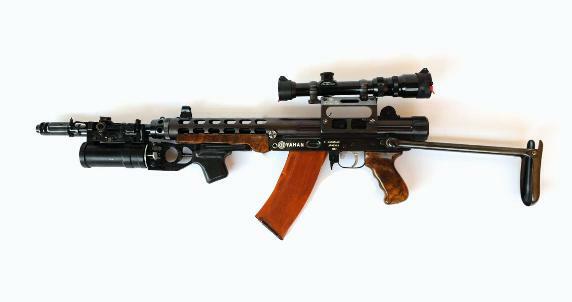 The name of this weapon had initially confused me with another Romanian-made assault rifle, launched by SC UZINA MECANICA CUGIR at the 2007 EXPOMIL show. I am talking about the "CUGIR ASSAULT RIFLE", essentially an Md.90 (Romanian 5'56x45mm AKM) with sidefolding stock and plastic furniture to revive the east-German WIEGER assault rifle system. The CUGIR ASSAULT RIFLE is manufactured in the pictured configuration (5'56mm caliber, sidefolding stock) for "institutional" export customers (military, LE). A fixed-stock, semi-automatic version for the civilian market is chambered in either .223-Remington (called the STG-2003C) and 7'62x39mm (called the STG-2000C) and is imported in the United States by INTER-ORDNANCE INC. CUGIR and InterOrdnance have plans to revive also the prototypal LMG and SSG versions of the Wieger system by using Wieger-style plastic furniture on .223-Remington/7'62x39mm semi-automatic RPK-style rifles and on 7'62x54R FPK/PSL (Romanian "Dregunov SVD").